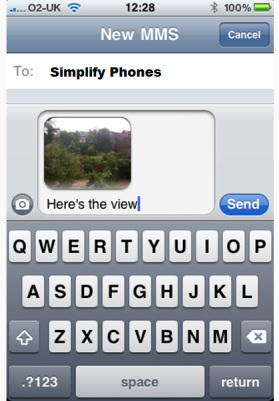 Every mobile phone is capable of sending messages by text. 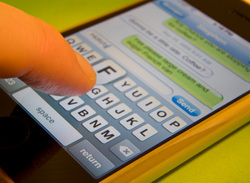 Simple messages using just characters are called text messages or SMS - short for Short Messaging Service. In the UK text messaging has overtaken actual voice calls as the commonest way we prefer to communicate with each other. A text message is simply a message we write using our phone keyboard which is no longer than 160 characters long including spaces. The 160 allowance counts every character and that includes any punctuation. It was the decision of a German researcher called Friedhelm Hillebrand back in 1985. He was working for GSM (Global system for mobile communication) and at the time they were responsible for developing and setting the standards which would be used for all mobile communication across the world. He studied the typical length of telegram messages and written postcard messages, and became convinced that 160 character was the optimum length to be able to communicate a simple message. Text messages are sent through a different channel to your voice calls and keeping the length limited to just 160 characters helped keep this channel operating quickly and also able to cope with vast quantities of messages because each one is so small. It also shaped the form that Twitter the social network would take. Twitter limits your 'tweets' to just 140 characters because they had to keep within the 160 character text limit but also allow enough room for your twitter username at the front of your tweet. If you add pictures / sounds or video to a message then you need to use MMS - short for Multi Media Messaging Service. This is a different system to the one that sends simple text messages. Commonly people using smartphones with cameras will use it to send photos. To use Picture messaging or MMS you need a smartphone capable of sending and receiving MMS messages (almost all smartphones sold today are) and you need to set up your smartphone to be able to do this. The commonest way for you to receive and send MMS is actually using the internet. Your network operator MUST switch on the MMS service to your phone and it can take upto 48 hours after activation to start working. Your operator to switch on picture messaging for your phone. Sending MMS costs more than a standard text message. As a general rule of thumb if the sender and receiver of the message are both in the UK only the sender pays, but if the sender is outside the UK, both of you will pay because of roaming charges.